Creative dance means creative teaching, too. Though leading a class of 3-year-olds may sound like fun and games to the uninitiated, there's a serious side to early childhood dance education. Each activity has a purpose: to develop cognitive, social and physical abilities. There are also specific teaching strategies for working with this age group. “It's important to understand how children think," says Rima Faber, who developed The Primary Movers, a curriculum for early childhood. “They don't think abstractly the way adults do. Children have to experience, to know what it feels like. They don't understand if you're telling them to feel this muscle or that one. You have to provide images that they have experienced." For example, she says, “In second-position plié, I tell them, 'You're like a park bench.' They already know a park bench is wide and open, so you give them that picture, then they can internalize it." Dance Teacher asked Faber and four other early childhood dance specialists to share their favorite tools and advice for success with pre-K children—an age group that is increasingly regarded as key for the growth of any dance studio. Even before 19th century Italian ballerina Pierina Legnani first performed the feat of 32 consecutive fouettés, dancers have known that “spotting"—or whipping the head quickly around during a turn so that the eyes remain focused in the same location—is an essential part of multiple turns. Spotting keeps a dancer from becoming dizzy during pirouettes, and it also gives turns a certain aesthetic sharpness. 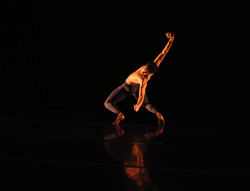 Dancers use spotting as a way to balance themselves and keep track of where the body is in space. Most dancers learn to spot when they first learn to execute pirouettes, but there are a few specific points that can improve even an advanced dancer's spotting technique. Here are some tips from the experts to help you teach better turns. Karen Clippinger uses a skeleton to illustrate a turnout exercise for middle-school students. Anatomy and kinesiology are usually subjects reserved for university-level courses, but even if your kids aren't quite ready for a lecture about the relation between the trochanter and the anterior superior iliac spine, there are simple, practical lessons that can help them visualize the inner workings of their bodies and serve as a great introduction to movement concepts. Helping students of any age experience anatomy and kinesiology concepts directly through exercises and moves they might use every day makes the information both immediately relevant and practical. They can begin to build an accurate vocabulary to describe human movement. K–12: An Innovative Disney Program in Schools Helps Children Discover a Passion—and Talent—for Musical Theater. Segerstrom Center brings Disney to Costa Mesa, CA, schools. Fromtop: Kendra Moore of The Lion King visits Stanley Elementary; students of Eisenhower Elementary perform Disney’s Aladdin. A whole new world opens up for a young elementary school kid performing the title role of Aladdin. It’s the first time he’s sung in front of his family, much less an audience. It’s the first time his school has put on a musical. The memory still brings tears to the eyes of musician and teaching artist Cynthia McGarity, who works with Segerstrom Center for the Arts in Costa Mesa, California. Therein lies the power of a remarkable program created by Disney Theatrical Group, which partners nationwide with arts organizations in nine cities to bring the joy of being onstage to youngsters in Title I schools who might never have thought of performing in a musical in their lives. “We had cast a boy as Aladdin who had this wonderfully rich voice—just like chocolate—but he was very, very shy. At first he wouldn’t even hold his head up to say a line audibly,” McGarity says. Launched in 2009, Disney Musicals in Schools was developed by the Disney Theatrical Group—which produces and licenses Disney musicals—and Music Theatre International, which, among other services, works with schools and community groups on pocket (JR. and KIDS) versions of Broadway shows appropriate for younger audiences. “It was born to fill a need we identified,” explains Lisa Mitchell, senior manager of education and outreach at Disney Theatrical Group. Over the years, as Disney licensed the abridged versions of its musicals for school-aged children to perform, she says, it became apparent that most requests came from suburban schools, and very few from urban and lower-income areas. 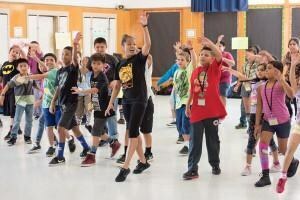 In just seven years, Disney has fostered the program nationwide via local arts organizations in New York, Nashville, Las Vegas, Seattle, Costa Mesa, Newark, Cleveland, Lansing and the San Francisco Bay Area, and brought it to 138 schools with nearly 13,000 kids at the third- through fifth-grade levels participating. 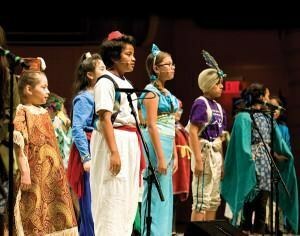 Like Segerstrom Center in Costa Mesa, each local institution receives a two-year $100,000 grant to identify four or five underserved, urban elementary schools and match them with four or five pairs of musical theater professionals who will work with each school’s faculty over 17 weeks, training them in the art of putting on a show. The teaching-artist visits, CDs of the musical tracks, scripts, DVDs of examples and the license to perform a special half-hour elementary school KIDS version of popular shows, such as Aladdin, The Aristocats or The Lion King, are all part of the grant, and offered free to the schools. Disney Musicals in Schools also provides a detailed teacher’s handbook that includes chapters on how to run an audition, how to rehearse the kids, ideas for costumes and staging notes. Organizations like Segerstrom select the schools from among applicants and tap into their connections to find the professional mentors, many of whom have Broadway national credits, in addition to a passion for education. The teachers and students provide the enthusiasm and energy. In the second year, Disney Musicals in Schools continues to support schools with a free performance license with ShowKit materials and invites faculty back for a Musical Theater 201 workshop designed to build on skills they gained the previous year, explains Mitchell. “The end goal is that they keep doing this, and 90 percent of schools that begin the program continue a long tradition of doing a show,” she says. 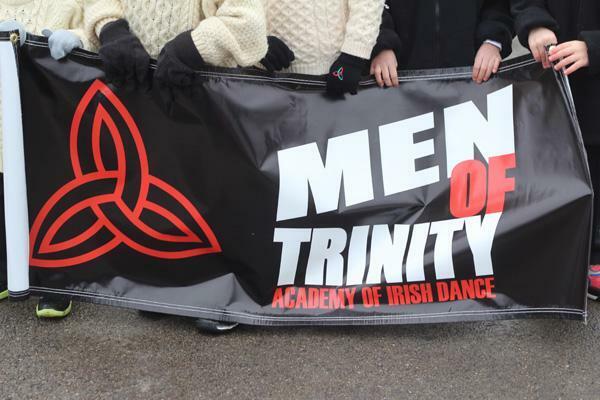 Trinity Academy of Irish Dance focuses on developing male dancers. 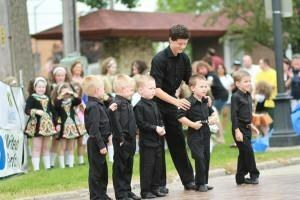 In the Irish dance world, as in the larger dance world, women tend to outnumber men. But with the Men of Trinity program, Trinity Academy of Irish Dance is encouraging boys to step into class and even more important, continue dancing into their teens. 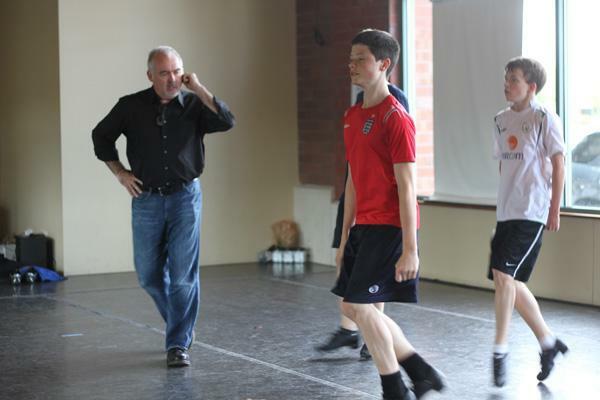 With three-time World Irish Dance Champion Peter Dziak as inspiration (and assistant instructor), Men of Trinity offers boys from as young as 3 up to young adult a special twice-monthly class that reinforces their regular technique classes and fosters camaraderie both inside and outside the studio. 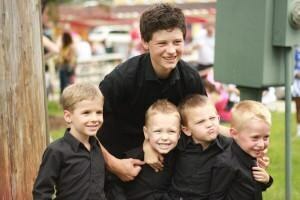 The four pillars of the program are bonding, competition, performance and teamwork, says Dziak, who followed his brother into dance classes at 4 years old and was highly influenced by male role models. 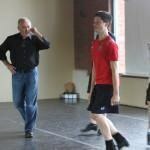 Trinity prides itself on creating an environment that welcomes male dancers, says Mark Howard, who founded Trinity Academy of Irish Dance in 1981. The organization has 15 locations in the Chicago area, serving roughly 1,000 students. Out of that, 80 boys (90 percent of total male enrollment) take part in the program at the school’s Elmhurst, Illinois, and Milwaukee, Wisconsin, locations. Howard’s wife Natalie was Dziak’s coach for most of his competition career and heads the new program. Dziak, now 17, also credits former Trinity student Joe Smith with mentoring and inspiring him to become a teacher. 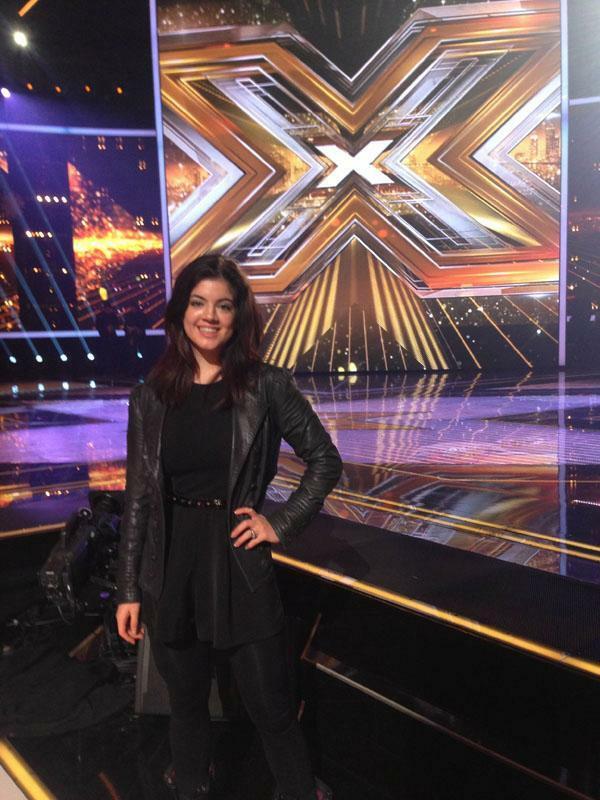 Smith will organize the program’s activities outside of the studio. Those games can teach concepts the guys can use in dance, whether it’s learning how to coordinate their bodies in space in soccer, building awareness of the position of other players in football or practicing the snap of a wrist in tennis. And while he encourages healthy competition, which naturally appeals to the youngsters, Dziak sees the class as promoting a sense of teamwork as well. Mary Ellen Hunt, a former dancer, now a teacher, writes about dance and the arts for the San Francisco Chronicle. Imitation may be the sincerest form of flattery, but where do you draw the line between inspiration and plagiarism? Protecting your work from being lifted is something many choreographers worry about. But what can you do to make—and keep—your work your own? We’ve compiled advice from both a professional and a legal perspective. You may be observing a group during competition or browsing around on YouTube, when you spot some moves that make you think, “Hey! That looks exactly like my dance!” But is it really? There are ways to identify if someone has actually—by legal standards—copied your work. 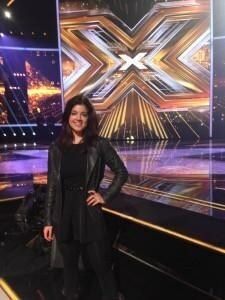 Julia Haye, an attorney in entertainment law and partner at Greenberg Glusker in Los Angeles, says the main question is how “substantially similar” a sequence of dance moves in one piece is to that in another dance. Social-dance steps and simple routines, she notes, are not copyrightable, and many dancemakers may be surprised to learn that music does not matter, only the composition and arrangement of movement. You can go further and register a work with the U.S. Copyright Office, which costs $40 per piece and entitles you to certain types of damages and penalties if you choose to sue someone who has infringed on your copyright. In the end, it may not be worth the time and money to sue, but springing for official registration for particularly important routines can offer you peace of mind. If you’ve been inspired by another dance, ask yourself these five questions to guard against plagiarizing someone else’s work. 1. If you’re emulating a phrase of movement, how many of the same steps are you using? How long is the phrase? 2. How many similar movement phrases from the original appear in your piece? 3. Are the transitions from one step to another unique? 4. Do you use different formations? K–12 teachers share their best practices. Studio teachers can take a lesson from K–12 educators when it comes to classroom management. 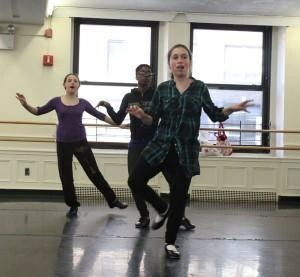 The greatest difference between studio students and those in a K–12 setting is that students in the studio generally want to be there,” says Elisabeth Gosselin, who teaches at Harlem Success Academy in New York City. But, she notes, even studio dancers need a teacher with strong classroom-management skills and compelling incentives. For any good teacher, the key to running a smooth classroom is setting high expectations for behavior and performance, giving explicit and direct instructions and being consistent with consequences. Those goals can be a challenge in a private studio, where parents might have a different relationship with the instructors than they might with a teacher in a public school. And yet, for kids, the studio and the classroom don’t need to be so different from each other. In fact, children can benefit from seeing strategies they’ve encountered at school repeated in the dance studio. Encouraging continuity from the academic day into the dance day can really stimulate students, says Baltimore public school teacher Judy Kurjan-Frank. This and many other ideas, both practical and philosophical, can translate well from a K–12 dance class to any kind of setting. In that spirit, we asked classroom teachers to share their strategies. Megan Doyle’s students get a lesson in tap vocabulary. If she’s introducing jazz pirouettes, for instance, her warm-up will focus on the difference between parallel and turned-out positioning. Exercises across the floor might concentrate on spotting and alignment in a fourth-position preparation, and then the combination will include the pirouette. Doyle also uses the wall space to follow her dancers’ achievements. She puts up a chart with every student’s name and writes the names of steps across the top. For young kids in hip hop, for instance, she might track isolations (head, shoulders, ribs, hips), slide clap, crazy arms, kick-ball-change or rock step and give a child a star every time they learn a step. “It also helps the parents see what their children are doing whenever they visit the studio,” she adds. For instance, you might instruct that one drumbeat means students freeze and put their hands on their knees. Two drumbeats might mean to immediately sit on the spot. In the process, kids are learning to pay attention to auditory signals, as well as when it’s appropriate to move or not move. Once the idea is in place, drumbeats are a quick way to quiet a busy class, or hit the “pause button” on rambunctious students if you need to make an announcement, for instance, or help an injured student. If the dancers bump into something, whether it’s the wall or each other, she sends them to the “bubble hospital,” a designated place in the room where they have to sit out for one turn while their bubble gets fixed. Be sure to let the students know that if they pop a bubble by accident, they are not in trouble, but they will need to be more careful next time. If a student pops his or her bubble on purpose or is obviously being careless, they’ll sit out for two or three turns. It’s all about respect: Melinda Waegerle and students of Jesse Wharton Elementary School. 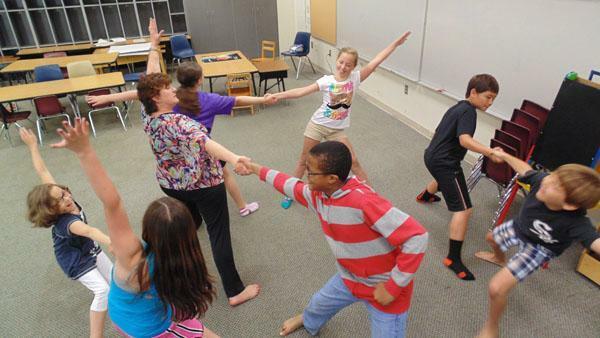 Creating an atmosphere of respect in the classroom is key to Melinda Waegerle, an assistant professor in dance education at the University of North Carolina at Greensboro. In her classes, she uses the American Sign Language gesture for “respect” as a quick, silent method of communicating with the dancers. “I want the students to know they need to respect themselves as learners, to respect others, their teachers, that they need to respect ideas. Having someone make fun of ideas or the way you did something can be devastating,” she says. Her students also learn to use other signs during class, to signal if they need to use the bathroom, for instance, so the interruptions to the flow of the lesson are minimized. “The students are savvy to that and pick up on it quickly,” she says. With the beat continuing on, everyone gets to be a leader as well as a follower, and there’s little time to get embarrassed or feel self-conscious. 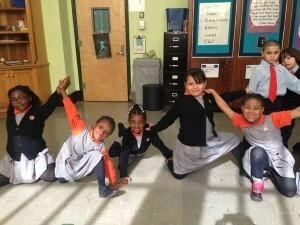 Elisabeth Gosselin’s class at Harlem Success Academy. This reinforcement also serves as a reminder to the entire class, giving them a chance to respond positively. Kathleen Isaac assigns special jobs, like serving as class DJ. One of the ways Kathleen Isaac addresses ownership of classroom etiquette and rules is to give special jobs to dancers in the class. She might assign entrance monitors to make sure students enter the room quietly; or shoe inspectors, who make certain the dancers’ shoes are neatly lined up; or back checkers to walk around the room with wands, reminding others to sit or stand up with tall dancer backs. A student might also be the class DJ, turning the music on or off and adjusting the volume. It can be a way to help a behaviorally difficult student to focus, but it can also encourage students to rise to a role of responsibility. 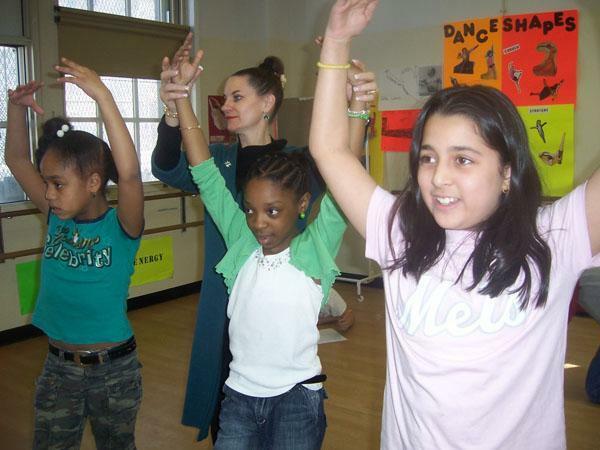 “This student-centered approach allows me to continue engaging students individually, in pairs, small groups and as a class,” says Isaac, who specializes in K–12 teaching practice as director of the Arnhold Graduate Dance Education Program at CUNY Hunter College. Watch, listen, do. Jeffrey Dobbs uses all three learning modes. In any class, particularly large ones, you’re likely to have groups of dancers who learn in a certain way, whether they’re visual, auditory or kinesthetic learners. Jeffrey Dobbs, who teaches at the Queens Valley School of the Arts in Flushing, NY, suggests observing students for a few classes to assess what kinds of learners they are, and then grouping together those who share similar styles. Mary Ellen Hunt is a former dancer and dance teacher.